Whilst there is much interest to be had from study of the hardware and operational arrangements of transport systems none of this exists or functions without people. The design, construction, operation and maintenance of the vehicles, the development and implementation of organisational procedures and the recruitment, deployment and welfare of the staff themselves together require a wide range of skills, knowledge and temperaments. This in turn generates the wonderful variety of characters that populate most organisations, and those concerned with transport in particular. We are grateful to many people for information and photographs of their own working lives with Chatham Traction, or those of their forebears. Other information is collected from local people or industry sources with an interest in the area and its transport. The era of the trams, and the period following the 1955 absorption by M&D when the Luton traditions were still strong, are both included in this study. These pages will be expanded as more information becomes available. 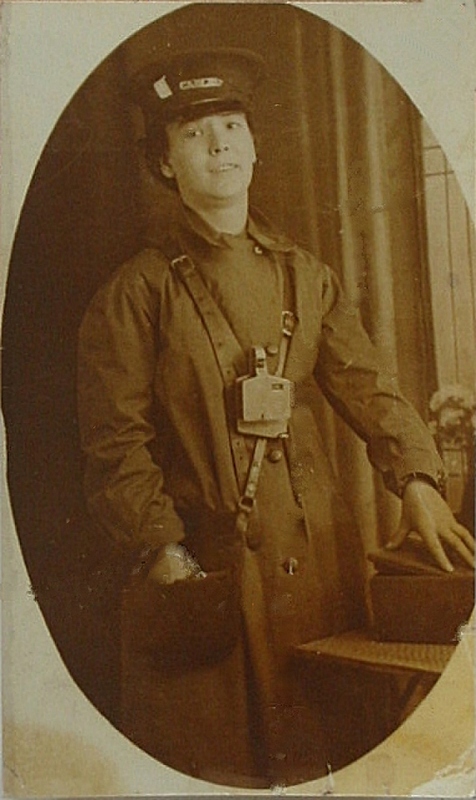 Mrs K Trice of Rochester provided this photograph of her mother taken during her employment as a tram conductress with the Chatham & District Light Railways Co. The period was probably during the Great War 1914-18. Many women were engaged to cover jobs of men sent away to fight. The ticket punch and cash bag were standard issue, with a ticket rack needed to complete the equipment. For further images of Chatham & District tramway staff see Ashley Birch’s “Buttons & Badges” website. Below, Driver Arthur Edwards (on left) and his conductor are seen during a layover at the Strand sometime in 1954. Their bus, a GKE Bristol, stands in the background. It looks like a hot, sunny day, probably with full buses to come. Driver Arthur Edwards and Conductor. Arthur’s wife Kathleen, née Roots, was a Luton depot conductress, and appears in the next photograph (standing far left). Luton conductresses line up in front of their new charges at Luton depot in late 1953. The eight RKK-registered Guy buses were delivered in November of that year.. Many other former employees have been mentioned to us. Superintendent Lionel Cronk and Engineering manager John Williamson are both well remembered and respected, whilst Conductor Brian Smith holds a special place as saviour of GKE 68, an act which enabled the whole heritage bus project.